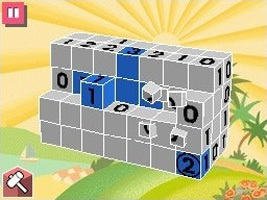 A puzzle game loosely based on the Picross series. Each puzzle is a cube shape made up of smaller cubes, and you must chip away the cubes to reveal a 3D structure. Rows and columns feature numbers indicating how many cubes should remain at the end. Once a puzzle is completed, the solution will be added to one of your collections. Level 5-B of the Tutorial is "Game Controller". The solution is based on the SNES controller.